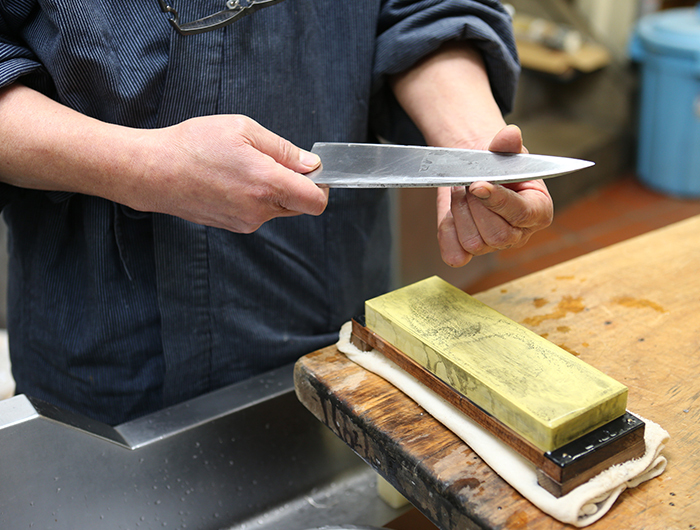 Sakai knives forged from steel are knives that require daily care. If left after use, rust will occur and if maintenance is not performed sharpness will worsen. When it comes to knife care, the most important thing is making sure it doesn't rust. If it is stored in a rusted state, the steel will corrode and, even after resharpening, the blade will become nicked. First of all, when it comes to regular care, it is important to wash clean and remove moisture. It is recommended to regularly sharpen. If you wait until you feel that the blade is losing sharpness, there will be lots of damage and it will take a lot of effort to sharpen it. By sharpening regularly, there is little damage and sharpening is easy, so you can always keep it in the same condition. Allow water to penetrate into the fine pores of the grindstone. Wait until bubbles stop coming out from the grindstone (approx. 20 minutes). *Recently, there are also grindstones available where this is not necessary. If there are usage instructions written on the packaging of a grindstone, please follow these. It is dangerous should the grindstone wobble as you are sharpening. Use a grinding wheel head or place on top of a damp cloth etc to firmly fix in place. Should the grindstone move as you are using it, it is very dangerous. Point the blade in front of you and firmly hold the knife handle. Using the thumb of the hand gripping the handle, push down on the flat blade surface to stabilize. Also, use your other hand to gently support the blade as in the picture. Set so that the knife fits in the grindstone from the tip to the heel. Keep so that the angle of the blade is always about 15 degrees. In order to sharpen uniformly, please stabilize this angle. Rhythmically, and without applying force, move by pushing from the front to the back, using a large area of the grindstone. When moving backward, from back to front, gently pull without application of force. Repeat this procedure. Checking the sharpening condition: Touch the cutting edge with your finger. If it has been sharpened well, there should be a metal burr on the cutting edge with a smooth feel. Sharpen until this metal burr is uniform on the entire cutting edge. When you have done this, sharpen the other side. Hold the other side of the blade so that the blade is pointing in front of you again. Should the blade be nicked, you can create a sharp blade by using a rough grindstone, medium grade grindstone and finishing whetstone, in that order. Usually, the order of the medium grade grindstone and finishing whetstone is not a problem. First, sharpen the edge with the blade. When the metal burr is formed, lay the back side flat against the grindstone and polish both sides alternately until the burr has gone. * Keep the angle toward the grindstone constant. * The thumb that touches the grindstone may become scratched due to rubbing. The sharpening surface of the grindstone will become distorted as you use it. On a regular basis, flattening with a "surface repair grindstone" is necessary. If you sharpen while it is distorted, sharpening will become uneven and there is a chance it may damage the blade.